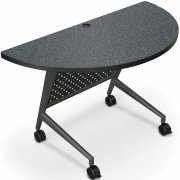 Add a contemporary element to any training room, classroom, or conference room with Trend Fliptop Training Tables. 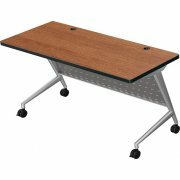 These seminar tables are designed for the bustling modern business, with a one-hand lever mechanism for hassle-free folding. With this arrangement, setup, cleanup, transport and storage are much simpler. 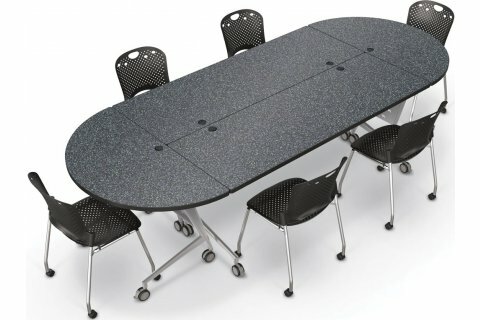 Trend Training Tables feature a sturdy build and are a pleasure to work at. 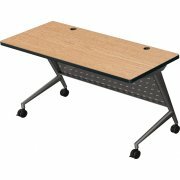 Powder-coated steel frames with a stretcher bar provide excellent support to the 1”-thick tabletops, while a perforated modesty panel creates a more private workspace and reinforces the sturdy frame. Keep your company in style and up to date with the latest seminar tables from Balt. Compact Design: With the top flipped down, moving and storing tables is much easier. Easy Flip: A one-hand lever makes folding down tabletops a cinch. Private Study: With a perforated modesty panel, the area beneath the table remains hidden from view. Reinforced Support: Powder-coated steel frames have a stretcher bar for enhanced stability. 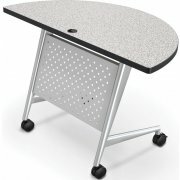 Smooth Roll: Tables roll easily on 3" dual-wheel casters (two locking). Versatile Arrangement: Use as individual tables or combine half-round and rectangular to create a conference table.